And is stricken in the flesh. On the eighteenth Sebastian was clubbed. With foul smoke she received the end of her life. "Yes cast many stones with violence,"
Spoke Tranquillinus from his heart. From the depths brought him to heaven. As he cried "You are my God" O God the Word. And he departed, when earth was thrown into the pit. Sharp spears Mark and Marcellinus. 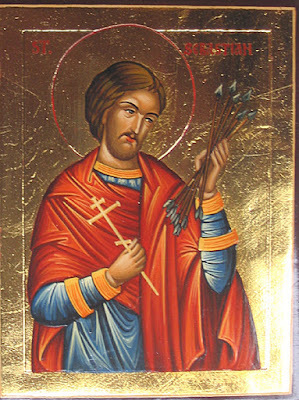 Of the above-mentioned Saints, the Martyr Sebastian was one of the imperial senators, during the reign of Diocletian and Maximian, in the year 292. 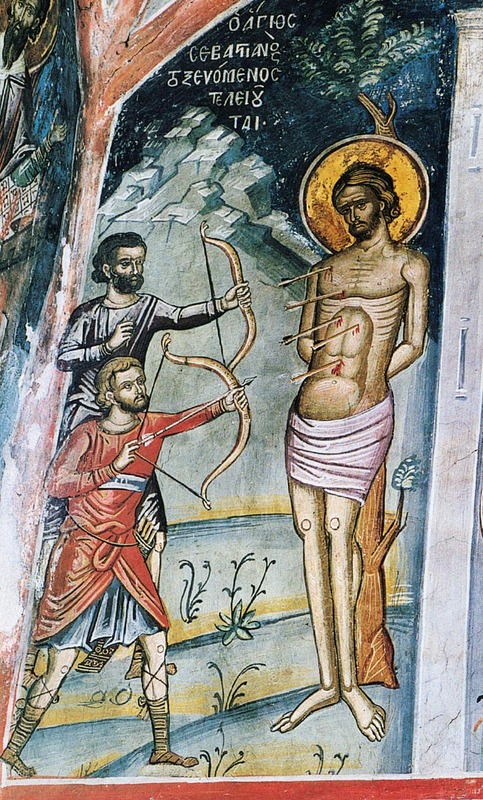 He was from Mediolanum in Italy, which today is called Milan, and incited many Greeks to faith in Christ. Marcellinus and Mark were more notable than the rest, both by their family and their wealth. As sons, their father was Tranquillinus and their mother was Marcia, and as brothers, they were as much physically as they were according to their souls. Because the both of them remained for many years in prison, and were tried with various torments, they were to be sentenced to beheading, so for this reason their parents and relatives gathered around them, in order to persuade them with laments and supplications, to deny their piety, while the renowned Sebastian did not want to impede them. 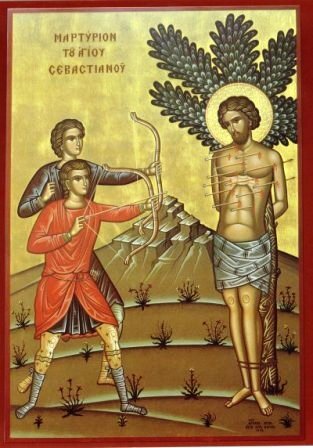 This brave struggler had first boldly confessed Christ (for until then he had secretly believed in Christ not due to fear, but in order to be able by this means to secretly persuade many towards piety). As I said, he was the first to confess Christ, and with amazing miracles he confirmed piety. Wherefore not only did he make firm in the faith of Christ the above-mentioned brothers, but also their father Tranquillinus, and many others by means of Tranquillinus he brought to the knowledge of God. For having come to believe, Tranquillinus catechized the eparch Chromatius. Chromatius invited the blessed Sebastian, and the presbyter Polycarp, and begged them to liberate him from the sickness by which he suffered. Having been liberated, he came to believe with all his soul in Christ. 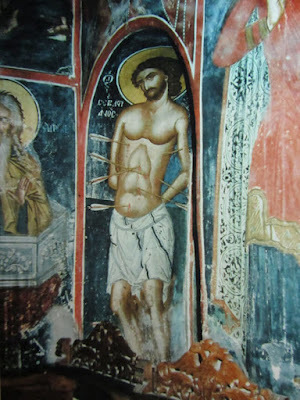 And having destroyed all the idols he could find in his house, he was baptized in the name of the Holy Trinity. Then Bishop Gaius ordained the brothers Marcellinus and Mark as Deacons. Their father Tranquillinus was ordained Presbyter. 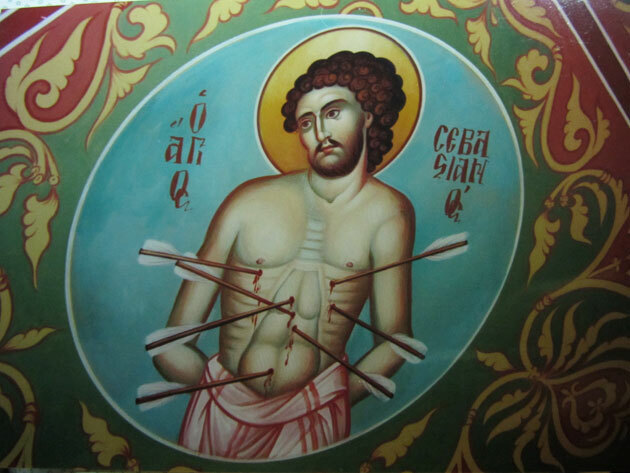 As for Saint Sebastian, he was appointed as an advocate for the Church. When Diocletian began a persecution against the Church, then all the others, namely Nikostratos the husband of the blessed Zoe, who held the office of primicerius, and the prison warden Claudius, and the steward of the imperial palace Castulus (who remained near the Saint, since the eparch Chromatius fled the city), and Tiburtius the son of Chromatius, and Castor and Zoe, all these, I say, were arrested separately. And after undergoing various torments, their life came to an end. 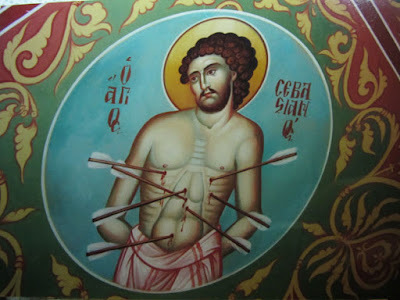 Saint Sebastian was brought before Diocletian and questioned, and he boldly confessed his faith in Christ. 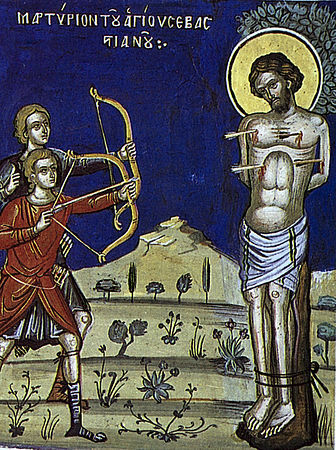 He was thus condemned to be tied to a stake, and bound there it was ordered that he be struck like a target and covered with arrows. Thus the body of the renowned one was like an urchin, covered with arrows. 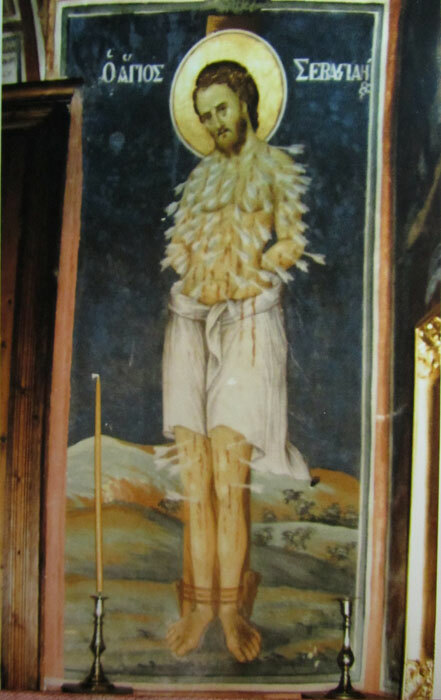 The members of his body were then beaten with clubs. And having been cut up into various pieces, he delivered his holy soul into the hands of God. 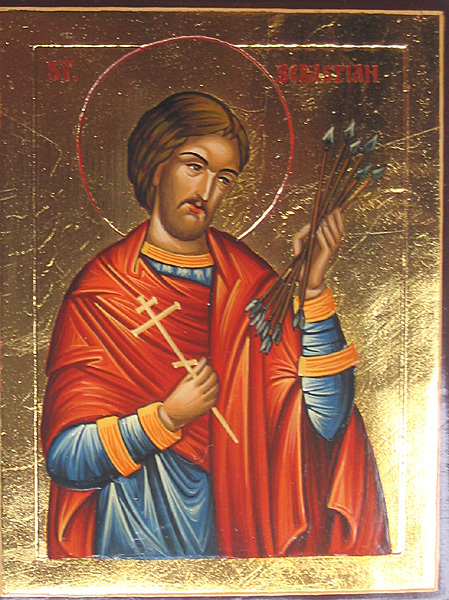 O Sebastian, thou didst spurn the gatherings of the wicked, and bring together the illustrious martyrs who with thee cast down the enemy. Deemed worthy of the Divine Presence, thou dost gladden those who cry to thee: Glory to Him Who has strengthened thee; glory to Him Who has crowned thee; glory to Him Who through thee works healings for all. 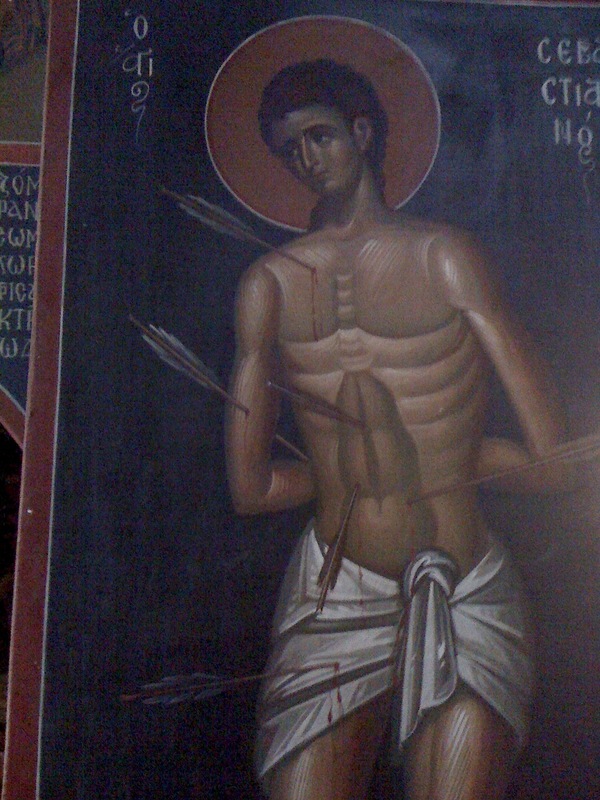 Thou didst excel in godly zeal, and gather a band of martyrs from which thou didst shine as a star. 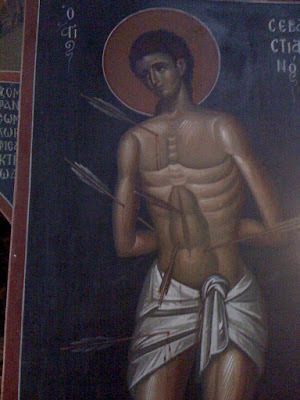 The arrows that wounded thy body, O Sebastian, pierced the hearts of the enemy. Hence Christ has glorified thee.